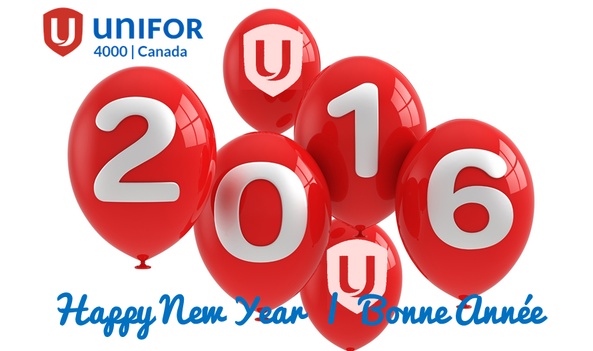 As we enter a New Year – 2016 – we look back at the year 2015 and some of the issues and stories featured on unifor4000.com and our Unifor National Council 4000 social media sites. It was a very busy year for Council 4000 and Unifor. 2015 was an emotional year. We lost two people who spent a good portion of their lives working on the behalf of our membership, dating all the way back to our years under the banners of the Canadian Brotherhood of Railway, Transport and General Workers Union (CBRT&GW) and the National Automobile, Aerospace, Transportation and General Workers Union of Canada (CAW-Canada). Following a recent diagnosis of pancreatic cancer, Brother Hugh Critchley passed away the morning of January 18, 2015 in Edmonton. Brother Critchley was the Regional Representative of our former Union, the Canadian Brotherhood of Railway, Transport and General Workers Union (CBRT&GW) servicing CN and VIA Rail members in the province of Alberta. He retired in 1994, a short time after the merger of the CBRT&GW and CAW. Prior to working full time for the Union, Brother Critchley was employed with CN and worked under Agreement 5.1. In January, Unifor Council 4000 and Local 4001 offered support to the 126 members of CUPE Local 7000 who were locked out on January 5, 2015 by their employer, Southern Railway of British Columbia (SRY). The SRY provides rail services to the lower mainland and Fraser Valley. The Union and its membership would not agree to SRY’s concessions. After a couple of days more than four months of lock-out/strikes, a new agreement was reached on May 8, 2015. A small group of Unifor Council 4000 and Local 4001 members at Rocky Mountain Catering Co. (RMCC) based in the Greater Vancouver Area and Kamloops, B.C., started a petition during the open period to decertify from the Union. The RMCC bargaining unit is a small group of some 58 members who work as cooks and catering staff at the Company that is based in Kamloops. Their primary business is preparing food on the Rocky Mountaineer tourist train that operates in B.C. and Alberta. After a vote taken by the Canada Industrial Relations Board (CIRB) on January 26, 2015, the membership voted in favour of remaining members with Unifor, Canada’s largest private sector union. Sadly, we faced the same situation again at the end of 2015, based on the employer only wanting to negotiate one year agreements based on them having to bid yearly for their contract with Rocky Mountaineer. Based on a couple of ill-informed members, and an employer who wishes to take advantage of this situation, we may face this situation every year. The last voted conducted in December 2015 again, saw the majority of members vote to remain with the Union. Unifor negotiated a new one year collective agreement with RMCC. We will be back at the bargaining table with the Company in 2016. Jennifer Murray, Secretary Treasurer of Unifor Local 4005 and National Election Committee Member for Unifor Council 4000, was appointed to serve as the interim Regional Representative for the Atlantic Region of Council 4000 and Local 4005, filling the vacancy of her Brother, Pat Murray, accepting a full-time position with Unifor’s Organizing Department in Atlantic Canada. Jenn was re-elected to this full-time position during the Council’s Regional Representative Elections in the spring of 2015. Every month of February is Black History Month. Unifor Council 4000 is pleased to recognize and celebrate the heritage, traditions and culture of the people of African descent and diaspora. During a Unifor Local 4004 General Membership meeting held on February 3rd in Montreal, Kasang Kashi, the Recording Secretary of the Local, was acclaimed as the new President of Local 4004. Sister Kashi replaced outgoing President Jean Simard, who previously announced that he was retiring from CN and his role with the Union. We thank Brother Simard for his contributions over the years, and we wish him well in retirement. The Unifor Council 4000 CN Bargaining Committees – CN Agreement 5.1 and 5.1 Intermodal Supplemental Agreement, Agreement 5.4, CNTL and CN Savage Alberta Railway – were making progress leading up to mid-December in our negotiations with CN on five collective agreements that govern our Council 4000 membership. Based on items that were beyond the control of our bargaining committees, we were unable to secure an early settlement by December 20th as the parties had hoped for. As negotiations ran into the New Year of 2015, while at the same time in negotiations with CN, Unifor was also in negotiations with CN’s competitor, CP Rail, bargaining a new agreement for the 1,700 shop craft members of Unifor Local 101-R. Unifor and CP reached a new agreement on Valentine’s Day. The Union immediately asked that CN meet the wage and benefit pattern based on the Unifor-CP deal, which CN initially rejected. This lead to CN tabling a final offer to the Unifor CN Bargaining Committees, which included Local 100 that represents CN shop craft workers, an offer that all bargaining committees rejected. On February 20th, CN issued notice that it would be locking out the CN Unifor membership effective 23:00 Local Time on February 23, 2015. Thankfully, after several hours of negotiations leading up to CN’s planned lock-out, with the assistance of Unifor National President Jerry Dias, then Federal Labour Minister Kellie Leitch and the Director General of Federal Mediation Services Guy Baron, and just minutes left on the clock to avert a lock-out of 4,800 members, we reached a tentative agreement covering 6 different Unifor Collective Agreements with CN. Our Council 4000/Local 4005 membership at Loomis and DHL in New Brunswick and Prince Edward Island ratified new collective agreements. These are relatively new members of Council 4000 and Local 4005. They join our existing DHL and Loomis Express members based in Nova Scotia. March 2 to 6, 2015 was International Women's Week (IWW), followed two days later by International Women's Day (IWD) on March 8. Each March, Unifor National Council 4000 both recognizes and celebrates the economic, social, cultural and political achievements of women, and the progress made to advance equality for women and to assess the challenges that remain. Over the past few years, our Council 4000 membership has grown across Canada. With that growth we have seen hundreds of new members of Indian ethnic origin. With many hundreds of Indo-Canadian members, we thought it was only appropriate to post an article on our website and social media sites about the Holi Festival, which began on March 6 and ended on March 7. Holi is an ancient Hindu religious festival, known as the festival of colours or the festival of love. The month of March began with scheduling various ratification meetings across Canada to ratify the tentative agreements that were negotiated with CN at Gatineau, Quebec, across the Ottawa River from Canada’s Parliament Buildings. Following our numerous cross-country meetings with our Unifor Council 4000 membership at CN, CNTL and CN Savage Alberta Railway, we ratified all five Council 4000 Collective Agreements by large percentages. On March 14th, the National Election Committee of Unifor Council 4000 opened nominations for the fulltime positions of Regional Representatives to service the Unifor National Council 4000 membership. These positions are elected to three (3) year terms. The terms became effective on July 1, 2015. Nominations were also posted for the full-time position of Secretary Treasurer for Council 4000 based on Heather Grant’s decision to retire. Sadly, today we still witness various forms of racial discrimination. With that being said is why each year, Unifor National Council 4000 recognizes the International Day for the Elimination of Racial Discrimination, which is held every March 21st. On March 17th, CN announced plans to build new Intermodal and logistics hub in Milton, Ontario, west of Toronto. This new facility would be operated in conjunction of CN’s Brampton Intermodal Terminal, CN’s largest Intermodal facility in Canada. However, since this announcement, there has been much concerns expressed by community leaders and some residents in Milton over environmental concerns and public safety in building this new facility. The Milton Chamber of Commerce voted to support CN’s plans, but one board member of the chamber allegedly resigned in protest. Just recently, the Canadian Chamber of Commerce expressed strong support of CN’s plans to build this new logistics hub in Milton, saying it believes the facility will “provide world-class infrastructure to improve the fluidity of rail traffic, and will better connect us to a global supply chain.” If this plan goes ahead, it will likely trigger many more jobs for Council 4000 and Local 4003 members at CN and CNTL. We will continue to post updates on this story on our social media sites. As in the case with Holi that is celebrated in March, we also recognized Vaisakhi for our growing membership of Indian ethnic origin. For many thousands of years, Vaisakhi has been the time when farmers have put their sickles to harvest and celebrated the coming of a new year. Today, millions celebrate Vaisakhi all over the world, and hundreds of thousands here in Canada in various festivals and parades. The 2015 Vaisakhi was officially held on April 14, but events are held all throughout the month. Each 28th day of April, Unifor National Council 4000 recognizes the National Day of Mourning to commemorate workers killed, injured or disabled on the job, or who suffer from occupational related illnesses. This day is also intended to show Canadians' concern for occupational health and safety. In 2015, we remembered Brother Jim Larmer, a Council 4000/Local 4001 member who suffered a fatal injury while at work at CN’s Vancouver Intermodal Terminal on September 9, 2014. On May 1st, we recognized International Workers’ Day – May Day. May Day is a day to honour the history and many struggles of those who have worked tirelessly to improve the lives of working people all over the world. On May 2nd, the Unifor Council 4000 National Election Committee released the first ballot results of the elections for Regional Representatives and the Secretary Treasurer. A number of candidates stood for nomination. We thank them all for their interest and congratulate the winners on the first ballot – Sister Jennifer Murray and Brothers Wesley Gajda and Mario Laroche were all elected as Regional Representatives. Brothers Ron Shore and Dave Kissack were acclaimed to their positions as Regional Representatives. A second ballot run-off was required for the remaining positions. In the month of June, we recognized the various Pride Events that take place each year across the country in celebration for the LGBT community and their struggles for equality. Earlier in 2015, VIA Rail Canada announced unilateral changes to the longstanding VIA Rail Pass Policy. Although some parts to this unilateral change were seen as being good, the change represented significant material changes to members’ free pass privileges, particularly in the case of their spouses and dependents. As a result, Unifor National Council 4000 submitted a grievance on this change. As the grievance was not able to be resolved within the grievance procedure between the parties, we had to refer the dispute to the Canadian Railway Office of Arbitration (CROA). Retired Unifor National Representative Abe Rosner presented the case before Arbitrator Christopher Albertyn on June 10, 2015. It took several weeks for the arbitrator to come to a decision in this important case. On June 21st, we recognized National Aboriginal Day, a day that every year recognizes and celebrates the cultures and contributions of the First Nations, Inuit and Métis peoples of Canada. On June 20th, the Unifor Council 4000 National Election Committee released the results of the second ballot run-off of elections for Regional Representatives and the Secretary Treasurer. We thanked all of the many candidates that stood for nomination and congratulated the ultimate winners – Brothers Andrew Stephen and Mark Robinson were elected as Regional Representatives, while Brother Danny Andru was elected as the Council’s new Secretary Treasurer. As a result of the 2015 Elections for Regional Representatives, we had to say goodbye to two Regional Representatives, Brothers Serge Auger and Jared White. They vacated their positions on June 30th. Earlier in the year, long-time Secretary Treasurer for Council 4000, Heather Grant, announced plans to retire from VIA Rail and ultimately Unifor National Council 4000. We thanked Sister Grant for her many contributions to Council 4000 over the years. We kicked off the month of July by issuing online, our VIA Rail Bargaining Survey, which gives Council 4000 members at VIA Rail the opportunity to participate in the bargaining process and inform the bargaining committee what are priorities for the upcoming round of negotiations with VIA Rail Canada, which were to commence later in the year. As in the case at VIA, Council 4000 also issued our Toronto Terminals Railway (TTR) Bargaining Survey on July 7th, which gives Local 4003 members at TTR the opportunity to participate in the bargaining process and inform the bargaining committee what are priorities for the upcoming round of negotiations with TTR. We kicked off the month of August with the launch of our Federal Election Page intended to keep members informed on the important issues that faced working Canadians. Canada needed a better government. And thankfully, Canadian’s recognized that. Election Day was on October 19, 2015, and Canadians from coast to coast to coast elected a new majority government lead by Justin Trudeau and the Liberal Party of Canada. The NDP dropped to third place, with the Conservatives forming the Official Opposition (away from Thomas Mulcair and the NDP) with less than 100 seats. Despite this fact, VIA did not properly implement the arbitrator’s award of CROA 4409. This caused many more weeks of meetings, conference calls and a subsequent hearing with Arbitrator Albertyn. A conference call was held on August 24th whereas Brother Abe Rosner asked Arbitrator Albertyn to order VIA Rail to comply with the arbitration award in CROA 4409. The arbitrator agreed and ordered VIA to advise all employees, as well as retirees, that their family members’ free pass privileges have been reinstated. The exact wording of the order still had to be worked out as well as issues regarding tax issues, as the Corporation claimed, for the first time in its history, that members and retirees must pay tax for family members’ travel. The Union has vigorously opposed this position and wonders why VIA would do this now, when the tax law hasn’t changed in this regard since the 1980s, at least. It was also clearly confirmed that the Union never asked, and the arbitrator never ordered, that VIA had to remove any of the new “perks” it had implemented, such as Business and Sleeper class for employees and retirees, and 50% discounts for friends. If VIA goes ahead and removes those provisions, it would be unfortunate, but it is strictly VIA’s own choice. Unifor National Council 4000 are members of the Unifor Rail Industry Council, along with Unifor Locals 100, 101-R and 103. Unifor National Council 4000 President Barry Kennedy serves as the Secretary Treasurer of this Council. The Rail Industry Council held its second meeting during the Unifor Canada Council held in Montreal this August. The Council was established at Unifor's first Canada Council which was held in Vancouver in August 2014, at which time the first meeting was held bylaws were passed and an Executive was elected. We acknowledged and celebrated Labour Day on September 4, 2015. Many Canadians are not aware that the Canadian labour movement can justly claim the title as the originator of Labour Day. On September 3rd, Brother George Baker, President of Unifor Local 4005 and member of the Unifor Council 4000 Executive Board, passed away suddenly. George was a 35 year employee with VIA Rail Canada. He initially hired on as a railway worker with CP Rail. He was involved with the Union for most of his years of service with VIA Rail, during the CBRT&GW days, the CAW and today’s Unifor. He has served as the President of Local 4005 since 2013. At the beginning of 2015, we lost another long serving Union Officer with Brother Hugh Critchley’s passing. It was an emotional year for Council 4000. On September 9, 2015, a supplementary hearing was held with Arbitrator Albertyn, whereas he rejected VIA’s application to the arbitrator for a “reconsideration request” of CROA 4409. We will continue to work on addressing the tax issues in the New Year. On September 11th, Unifor National Council 4000 issued a letter of support to Toronto Area container truckers who are members of the Container Trucking Association of Ontario (CTAO) and who commenced a strike at 12:01 a.m. EST on September 8, 2015 over long work hours, a decade of low rates, long wait time, increasing costs to maintain their trucks, for greater dignity and respect and to be seen and classified as skilled trade workers. These are concerns and issues shared by many truck drivers who work as independent/dependent contractors and owner-operators in the container trucking industry. Unifor National Council 4000 represents almost 900 owner-operators employed at CN Transportation Ltd. (CNTL) across Canada. On September 11th, we issued our Rocky Mountain Catering Co. (RMCC) Bargaining Survey to Local 4001 members to participate in the bargaining process by informing the bargaining committee what are priorities for the upcoming round of negotiations with RMCC. John Dowell, the President of Unifor Local 4001, was hospitalized on October 3rd after experiencing abdominal pain. He was operated on three times over a week long period and his condition was not good. We believed that he would not make it. Brother Dowell remained in ICU until November 12th, and remained in the Grey Nuns Hospital in Edmonton right through until the New Year. We are pleased to report that on January 8, 2016, Brother Dowell was finally released from hospital and is now resting at home comfortably. On October 29th, we announced our new Unifor Council 4000 Events Calendar. The calendar will feature various events and meetings related to Council 4000 and Unifor Locals 4001, 4002, 4003, 4004 and 4005. It will also include dates for arbitration hearings of the Canadian Railway Office of Arbitration and the locations of these hearings. The calendar is accessible from off the home page of unifor4000.com. Unifor officially opened negotiations with VIA Rail Canada on October 29th in Montreal. Unifor has three collective agreements with the Crown Corporation that govern more than 2000 Unifor members who work in a variety of jobs. The current collective agreements expire at 23:59 local time on December 31, 2015. Unifor National President Jerry Dias joined the bargaining committees of Council 4000 and Local 100 to kick off VIA Bargaining. Unifor National Council 4000 met with VIA twice for full week sessions of collective bargaining in November. Council 4000 established a VIA Rail Bargaining Updates Page on unfor4000.com that will provide updates on bargaining as the information becomes available. Bargaining will reconvene in the New Year the week of January 25th in Montreal. Unifor Local 103 members at the Ontario Northland Transportation Commission (ONTC) were locked out by the ONTC and the Ontario Government on November 11, 2015 - Remembrance Day. Contract negotiations have been ongoing since 2013 for 195 of the 350 Local 103 members at the ONTC who work in the remanufacturing and repair division of the Company employed as train and bus mechanics. Unifor Council 4000 sent a letter of support to the Local 103 ONR Bargaining Committee and its membership. We are happy to report that a deal was finally reached December 13th. Unifor Council 4000 acknowledged the International Day for the Elimination of Violence against Women, held every November 25th each year. Our collective agreement with the World Trade and Convention Centre (WTCC) in Halifax expired in 2015. WTCC are longtime members of Council 4000/Local 4005. Sister Jennifer Murray, Regional Representative for Council 4000 in the Atlantic Region, will be a member of the Unifor WTCC Bargaining Committee as she services this membership. On December 6th of each year, Unifor Council 4000 remembers the horrific day of December 6, 1989 when 14 women who were violently murdered at the École Polytechnique in Montreal, Quebec. On December 8th in Toronto, Unifor National Council 4000 officially opened negotiations with Toronto Terminals Railway (TTR). The collective agreement expired at 23:59 EST on December 31, 2015. As in the case of CN and VIA Rail bargaining, we will be establishing a bargaining updates page for Unifor-TTR bargaining early in the New Year. We will commence actual negotiations with the Company on January 21 and 22, 2016 in Toronto. The above are just a few of the activities, events and issues of Unifor National Council 4000 in the year 2015. We expect 2016 to be just as busy. ​We wish all of our members, and the guests to this website, best wishes, good health and prosperity for the year 2016! Keep visiting unifor4000.com and our social media sites - Facebook, Twitter and Google+ - for news and information.